Continuing our series on healing and wellness, Kate Green visits Ann Hamilton’s project exploring touch and care, commissioned by Landmarks, the public art program of the University of Texas at Austin. Installation view of Ann Hamilton’s O N E E V E R Y O N E, 2017, at the University of Texas at Austin. Courtesy the artist and Landmarks, the public art program of The University of Texas at Austin. Photo by Paul Bardagjy. Like the practice of medicine, photography attempts to arrest time using science, but as if by magic. Photographs also record a person’s relationship with the world, a subject that has long been at the heart of Ann Hamilton’s work. 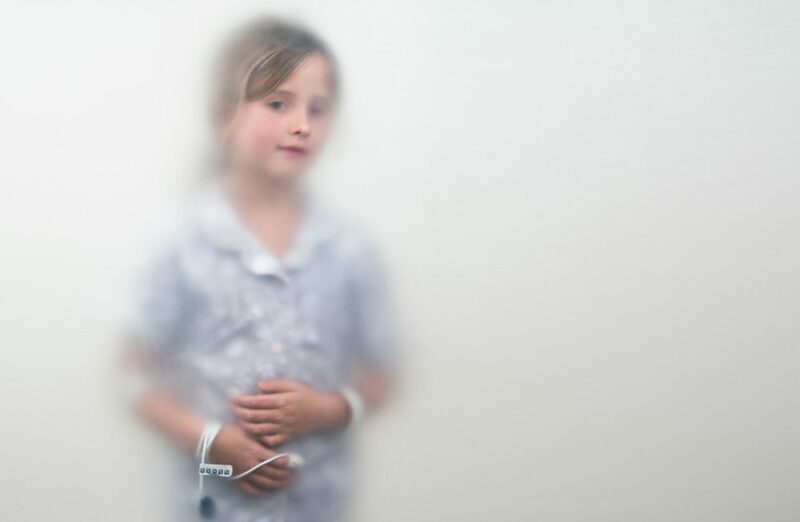 It is fitting, then, that Hamilton’s project O N E E V E R Y O N E, 2017, recently installed in the Dell Medical School of the University of Texas at Austin, revolves around both photographs and medicine. In this case, the pictures are of people who responded to an open call. Each subject—there are hundreds—stands against the same bright white backdrop and behind a translucent scrim. Wherever the body—a hand, shoulder, or face—touches the scrim, it comes into focus, while the rest of the corpus recedes into hazy light. The bodies of most of the subjects are turned toward the viewer, yet their faces are often turned away, as if each is lost in private thought. The project, which comprises large-scale prints, a book, and a newspaper, depicts people who are seemingly at once alone and together. Hamilton earned degrees in textile design and sculpture but has used various means, including photography, to position the individual in relation to the wider world. Think of the artist’s early installation tropos, 1993, made the same year Hamilton was named a MacArthur fellow. The installation took over a cavernous room in the Dia Art Foundation’s former building in Chelsea. The floor was covered with horsehair, in the middle of which a performer sat with a book, burnishing out each line of text as she read it, while barely audible sounds murmured from speakers around the room’s perimeter. Several years later, for the series face to face, 2001, Hamilton placed a pinhole camera in her mouth which, when she opened it, exposed film within. The resulting photographs capture the dark interior of Hamilton’s orifice and her parted lips, through which are recorded glimpses of what she encountered—a person’s face, a stand of trees. We see Hamilton from the inside out, the individual inseparable from her surroundings. O N E E V E R Y O N E, commissioned by Landmarks, the University of Texas’ public art program, began with an open call for photographic subjects, which circulated to those involved in the school, the arts, and beyond. Hamilton welcomed anyone who “provided or received care,” in other words, everyone. Over a three-week residency, more than 500 people—from nurses to professors, from children to the elderly—were photographed at twelve locations in Austin. From these sessions directed by Hamilton, wherein each person stood behind a scrim made from a material called Duraflex, a library of 20,000 images was amassed. Catalogued by the subjects’ first names, these images are available for free online as downloads, in a textless 900-hundred page book published in an edition of 10,000 that includes at least one picture of each subject, and in a newspaper that features a selection of images alongside essays by art critic Nancy Princenthal among others. The complimentary book and newspaper can be picked up by anyone from carts stationed around campus, until they are all gone. Ann Hamilton, O N E E V E R Y O N E · Zoë, 2017. Courtesy the artist and Landmarks, the public art program of The University of Texas at Austin. O N E E V E R Y O N E gains gravity, however, when the images are seen printed at large scale and hung together, in a physical space. An affecting recent exhibition at the campus’ Visual Arts Center featured 49 pictures—the smallest around three feet tall and the largest nearly seven feet—along with the book and newspaper. 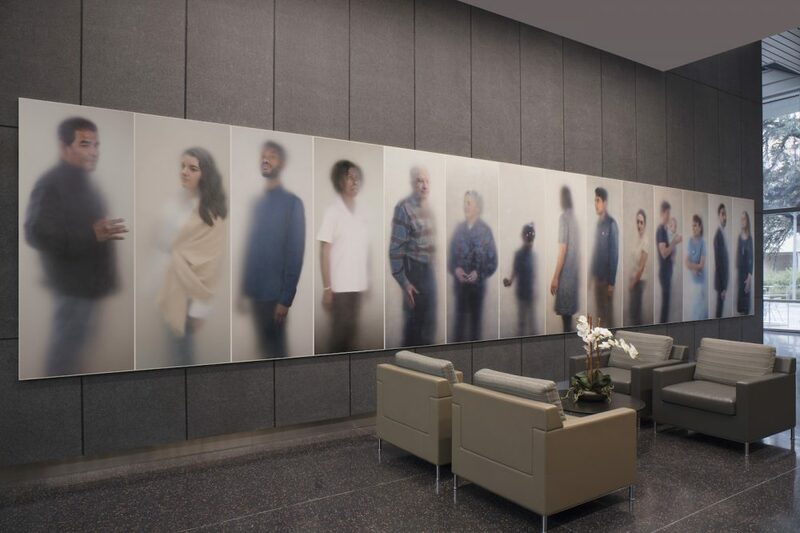 But the project resonates even more deeply when the images are seen in their permanent physical location, on the walls of buildings devoted to the art and science of healing. So far fourteen O N E E V E R Y O N E images have been installed in the Health Learning Building on campus, and more groupings will be installed as structures are completed. The images are presented in vibrant color on larger-than-life-size enamel panels, at two-and-a-half feet wide and more than six-and-a-half feet tall. Among those pictured in the current installation are adults of all ages and skin colors, a young girl, a man holding an infant, and an elderly gentleman and woman. Here, everyone receives equal due and gently commands attention. At one end of the grouping hangs an image of a middle-aged white woman, whose body is turned from the camera as if towards the others. Her outstretched hand, along with her steady gaze and black dress, convey strength and serenity in equal measure. Facing her at the other end of the line of images is a photograph of a Latino man of a similar age. A raised brow and knuckle, pressed white against the scrim, suggests resolve. Toward the center of the grouping is a picture of a man standing and holding an infant, perhaps his daughter. Each grasps the other—the baby’s legs and arm wraps the man’s chest—yet turns outward, to the world beyond. A photograph of an African-American girl, perhaps six years old, holds court in the middle of the installation. Her brightly colored hair beads and active fingers come into focus, and her eyes appear closed. She is movement and life, alone in play, surrounded by Hamilton’s other subjects. Ann Hamilton’s O N E E V E R Y O N E was unveiled January 26 - 28, 2017, at the University of Texas at Austin’s Dell Medical School.